To the Batmobile, Robin! Everyone knows the Batmobile has a lot under the hood, but now it's got something even better under there - your change! 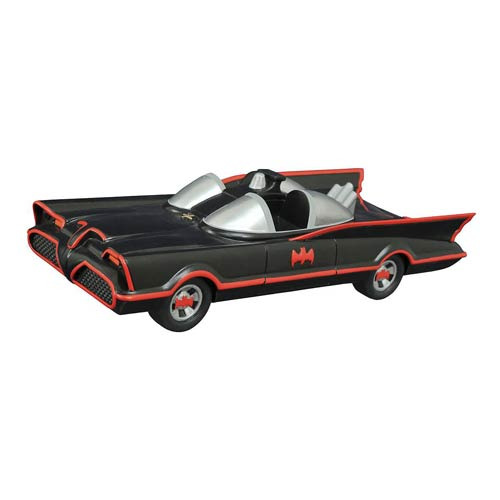 This vinyl version of the Batmobile from the Batman TV series measures 11-inches long, has a coin slot between the seats, and an access door in the base, meaning this high-quality vinyl replica is also a bank! Park the Batman Classic 1966 TV Series Batmobile Bank in your Batcave and start saving your non-giant pennies and scarred silver dollars. Ages 8 and up.